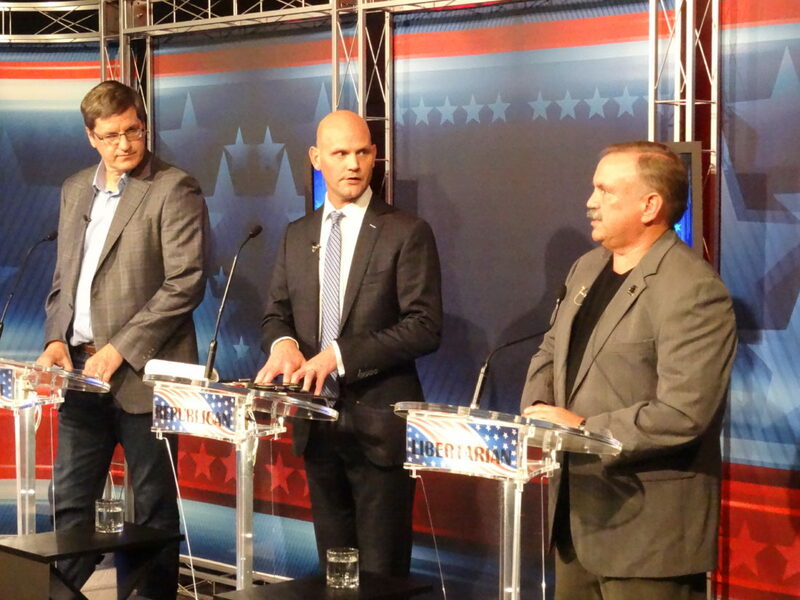 Democrat Brian McClendon, left, Republican Scott Schwab, center, and Libertarian Rob Hodgkinson, the three candidates for Kansas secretary of state, face off in a televised debate on KTWU-TV, in Topeka, on Monday, Oct. 15, 2018. TOPEKA – The three candidates for Kansas secretary of state squared off in a televised debate Monday, offering different opinions on a wide range of issues, including whether the state needs to change the election laws that changed dramatically under the current administration of Republican Kris Kobach. Democrat Brian McClendon and Libertarian Rob Hodgkinson both said they would push for changes in a number of areas, including the requirement that voters show photo ID at the polls, and the composition of the State Objections Board, which was called upon several times this year to determine whether certain candidates were qualified to be on the general election ballot. Republican Scott Schwab, on the other hand, said he supports the state’s existing laws, but argued that county election officials need better training and guidance on how to implement those laws. McClendon, however, suggested there should be significant changes in voting laws, including dropping the appeal of a federal court ruling that struck down one of Kobach’s signature pieces of legislation requiring people to show proof of U.S. citizenship in order to register to vote. But he also called for revising the law requiring voters to show photo ID at the polls in order to cast a ballot, arguing that many young people, as well as many seniors, do not have driver’s licenses. “We need counties to either provide ID freely and efficiently so everybody can get it, or we need to change the law to solve this a different way,” McClendon said. Hodgkinson said he understood the need for voters to identify themselves at the polls, but agreed with McClendon that many elderly people who don’t drive have difficulty obtaining an alternative ID. McClendon and Hodgkinson also called for changes in the State Objections Board, which currently comprises the secretary of state, lieutenant governor and attorney general, all of whom are elected officials and, currently, Republicans. McClendon and Hodgkinson said that body should be made up of nonpartisan appointed officials; Schwab said the current system has worked well and that having the members appointed by other partisan elected officials would not remove partisanship from the process. This year’s race for secretary of state represents one of the first truly competitive races for that office in many years. Historically, Republicans have held the office for nearly all of the state’s history. Kansas hasn’t elected a Democrat to the office since 1948. McClendon, 54, of Lawrence, is a former tech executive who worked at Google and Uber before returning to Kansas in 2017. He has a well-funded campaign, supported in part from former tech industry colleagues. 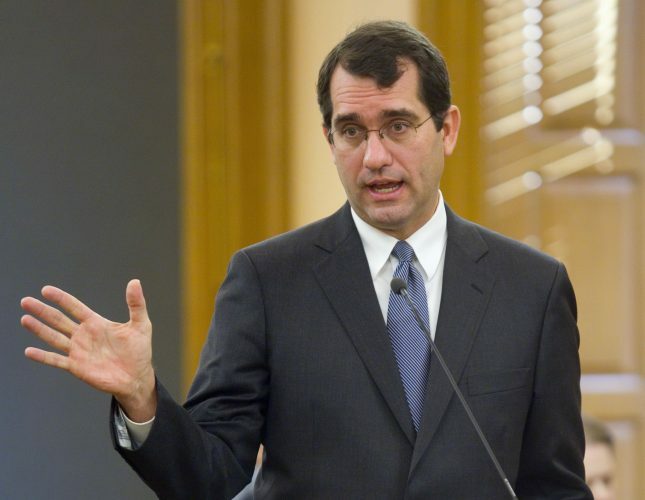 Schwab, 46, of Olathe, is the current speaker pro tem in the Kansas House and a former chairman of the House Elections Committee. He was first elected in 2002 and served two terms before stepping down in 2006 for an unsuccessful bid for the 3rd District congressional seat. He returned in 2008 and has been re-elected four times since then. Hodgkinson, 59, of Stilwell, is a former chairman of the Kansas Libertarian Party who now works in real estate in Johnson County. The debate was broadcast live from KTWU-TV, the PBS affiliate in Topeka, and was co-sponsored by the Washburn University Political Science Department.